Amazon this week revealed that New York City and Northern Virginia have been selected as the new co-locations for its highly sought after HQ-2. With that news, the governor (of Pennsylvania) reported that his office had promised Amazon economic incentives totaling $4.6 billion, some of that in tax abatements. Both Philadelphia and Pittsburgh had been listed among the top 20 finalists under consideration. In making its announcement, Amazon acknowledged that infrastructure and employee base had much more to do with its selection than did government-backed financial incentives. In past Roundups, I have argued for the curtailment of welfare programs which trap families in a cycle of dependence. Despite record spending, some programs appear to net worse results. I am not opposed to spending public money to assist the less advantaged, but I am opposed to costly programs which do not appear to work. Spending taxpayer money to help the poor is, at least, related to a laudable objective. But spending the taxes which you pay to assist wealthy companies like Amazon is entirely wrongheaded. To begin with, Amazon does not need our money in order to be successful. Secondly, using public money to “buy” new business is a slap in the face to existing businesses, which are unable to take advantage of some of the offered incentives. Unquestionably, the government has a responsibility to lay the groundwork for the solid infrastructure upon which fluid commerce depends, but outright financial incentives to wealthy businesses are bad public policy. Most poignant of all are tax incentives offered by the state in order to lure business. What clearer indication do you need that your state’s tax structure is a barrier to business than the acknowledgement that you have to give businesses relief from your own taxes in order to convince them to move to your state? 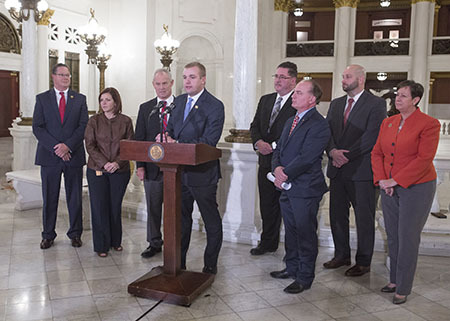 At an effective corporate net income tax rate of 10 percent, the highest in the nation, Pennsylvania should think long and hard about what contributed to losing Amazon’s new headquarters and the impact that our rusty business taxes had on that decision.